“Gateways to the Mind” (Bell Labs, 1958). 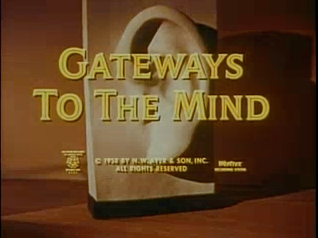 “Gateways to the mind” was part of The Bell Laboratory Science Series, a collection of educational films made for Bell Labs by Frank Capra and others. This one was made by Owen Crump. In a mix of live-action and animation, the film explains the functioning of the senses of touch, sight, hearing, etc.. The host of most of the eight films was Dr Research, played by Frank C. Baxter. The film uses a welter of analogies to depict the senses and the nervous system, beginning with a movie soundstage, with its lights, microphones, and cameras. As the film progresses, it moves on to a host of other references, notably (given that the films were made by Bell Labs), a telephone switchboard. The film works its way from the ancient Greeks to the 1950s, and from the peripheral nerves to the brain. “Gateways” presented a general account of the senses but also featured the work of several scientists in particular. The film presents Princeton psychologist Hadley Cantrill’s work on perception, the optical physiology of George Wald, and the claims of McGill neurosurgeon Wilder Penfield about the neurophyiology of memory. “Gateways to the mind,” “Editor’s Page,” J. Opt. Soc. Am. 48, 764-764 (1958). Penfield, Wilder, Epilepsy and the functional anatomy of the human brain (Boston: LIttle, Brown 1954). Penfield, Wilder, Some observations on the functional organization of the human brain (Washington DC, Annual Report, 1956). Ittelson, William H, and Cantril, Hadley, Perception, a transactional approach (Garden City: Doubleday, 1954). Cantril, Hadley, Transactional perceptual theory and expeimental work, (Defense Technical Information Center, 1954). Perry, John, Our Wonderful Eyes (1955). Wald, George Life and Light (W.H. Freeman, 1959). Wald, George. Innovation in Biology (San Francisco, Freeman, 1958).